All 13 chromium steels have about 12 to 14% chromium and other minor alloying additions, and can be placed into two general groups: conventional and modified. Conventional 13Cr steels (13Cr) are those most common in oil and gas, some of which are CA6NM (UNS J91150), AISI 410(UNS S41000), and AISI 420 (UNS S42000). These alloys have excellent corrosion resistance when compared to carbon steels up to about 300°F (150°C) and are used for a variety of wellhead, tubular, and downhole components, but they have very limited resistance to cracking in H2S. Modified 13Cr (M13Cr) steels came from the need for increased corrosion resistance at higher temperatures, increased H2S cracking resistance, and increased yield strength above 85 ksi (586 MPa) primarily for tubular goods and other downhole equipment. These were developed by taking a 13Cr and adding nickel (Ni), molybdenum (Mo), copper (Cu), and other alloying elements. M13Cr provide better corrosion resistance than 13Cr up to about 350°F (177°C), yield strengths up to 110 ksi (758 MPa), and improved H2S cracking resistance. Figure 1 compares laboratory corrosion rates of carbon steel, a 13Cr, and a M13Cr in a given CO2 containing environment. 13 chromium steels do have limitations. As stated, they are sensitive to cracking in H2S containing environments, but they are also susceptible to cracking at very low pHs. NACE practices limit the hardness and heat treatments of many 13 chromium steels and provide environmental limits to prevent sulfide stress cracking (SSC). The environmental limits require H2S partial pressure, chloride concentration, and pH be considered when determining if a 13 chromium steel is acceptable for use. 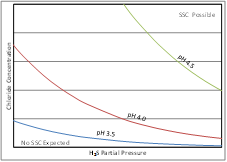 The H2S partial pressure becomes a more interesting issue in high pressure/high temperature (HP/HT) completions. At the anticipated high reservoir pressures, only a few ppm of H2S are required to exceed the provided NACE environmental limits. Additionally, 13 chromium steels are susceptible to environmentally assisted cracking if the pH drops to significantly less than 3.5 or very rapidly without H2S being present. GATE, LLC has developed a method for estimating acceptability for some 13 chromes in various oil and gas environments to account for H2S, pH, and chlorides. Figure 2 illustrates the changes in SSC susceptibility of a 110 ksi (758 MPa) grade 12Cr-5Ni-2Mo M13Cr associated with H2S partial pressure and chloride concentration for different pHs at room temperature. concentration for different pHs at room temperature. Another limitation to 13Cr steels is pitting. When these steels are exposed to oxygenated fluids, pits form rapidly, and the surface will not be able to re-passivate in these locations. Given sufficient time, the pits can propagate in to severe cracks or become pronounced localized corrosion, and the steel will no longer be resistant to corrosion in those locations. Oxygenated fluids can be as benign appearing as condensed water on the steel or rain water, and will cause pitting if not readily dried. The selection of which 13Cr or M13Cr steel to use can be challenging depending on the service environment. GATE, LLC’s expertise in material selection has identified several important environmental conditions that should be considered when selecting 13Cr steels for oil and gas use: acidizing and acid flowback, flowing production environment, and shut-in environment. Each of these environmental conditions presents different factors that determine the feasibility of using a MSS, which alloys should be considered, and how selected ones can be further evaluated if required. Table 1 lists the primary environmental factors that have to be considered when selecting a 13Cr alloy for use in oil and gas developments. The current industry trend is to use higher strength materials in more corrosive, higher temperature, higher pressure environments with substantially longer design lives. Reservoir souring is being considered more frequently and acidizing is be coming more intense, making the selection of 13 chromium steels more difficult, and their applicability that much more critical. 13Cr and M13Cr are very beneficial to oil and gas due to their cost, strength, corrosion resistance, and availability, and will remain beneficial for the foreseeable future. GATE, LLC has developed novel methods for selecting and qualifying conventional and modified 13Cr stainless steels in a variety of sweet and sour environments to aid the industry as it approaches these challenges.